Description : Welcome to our New Super Mario Bros. U walkthrough! This is a 100% walkthrough of the game, we collect all star coins in every level and show you all the secrets of the game. We play with Mario, Blue Toad and Yellow Toad. Enjoy! 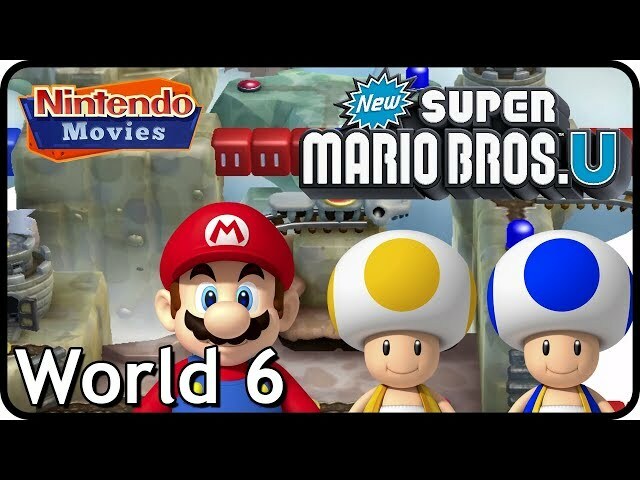 In this video we show Rock-Candy Mines, World 6 of New Super Mario Bros. U. Rock-Candy Mines is a puzzle world. The world map has red and blue blocks which need to be enabled and disabled to reach certain levels. Only by discovering secret exits you can get to some levels or secret entrances to levels. This world is rock themed and has some hard levels. Don't fall down! Please enjoy, subscribe and like and make sure to press the bell icon to get notified of our newest uploads! 26:40 - Rock-Candy Mines-5: Walking Piranha Plants! Mario is played by Maurits. Blue Toad is played by Rik. Yellow Toad is played by Myrte.